End crimeless revocations. The largest number of people entering Wisconsin prisons are actually re-entering prison. 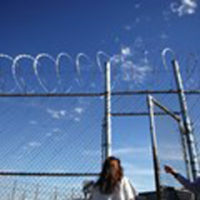 About 4,000 prison admissions each year are people who have not been convicted of a new crime. Open the doors of opportunity through Ban the Box legislation, reform of the CCAP on-line database, changes in rules for public housing, financial aid for college, and more. Welcome formerly incarcerated people back to the community and ensure that formerly incarcerated people have a voice in the community and in matters that affect them. They ought to have back their right to vote, and to be heard.